Model Rocky Barnes has amazing bohemian style; here’s how you can get it. Maybe it’s because she gives me crazy wanderlust. (Girl is always traveling!) Or maybe it’s the way she perfectly and effortlessly rocks the easygoing, bohemian style that I’ve been trying to pull off for months, to no avail. Whatever it is, I knew I just had to feature her in this series. Like you might would imagine from the description above, Rocky is Southern California born and bred and she gets to travel the world for her modeling career, going to the exotic destinations on all of our bucket lists. Needless to say, I’ve been following Rocky as long as I’ve had an Instagram. Let’s get into how we can get that Rocky Barnes style vibe! This is an outfit Rocky wore on a 4th of July trip to the Hamptons with Revolve. As you might imagine, that means pretty much all the pieces she’s wearing are from Revolve and will run you at least $50 each. Recreating her look was a lot simpler than you might think. It starts with statement culottes, thanks to a pair of similar polka-dotted pants from Wearall. This is the perfect outfit for brunch with the girls or taking a stroll and window-shopping through your city. Kimonos can be tricky to style. A kimono, especially a printed one like Rocky wears above, makes a big statement, so it’s important to allow it to be the focal point of the look. To keep the rest of her look appropriately simple, Rocky pairs her kimono with a black bodysuit, fitted boyfriend jeans, and clear heels. Finding a kimono I liked as much as Rocky’s was hard – after all, nice kimonos can run you upwards of $100. This one from Urban Outfitters, however, is significantly less expensive than hers but gives off a similar vibe. One-shoulder tops and ruffles have been so trendy this year. However, I’ve been hesitant to give them a try myself, especially together. 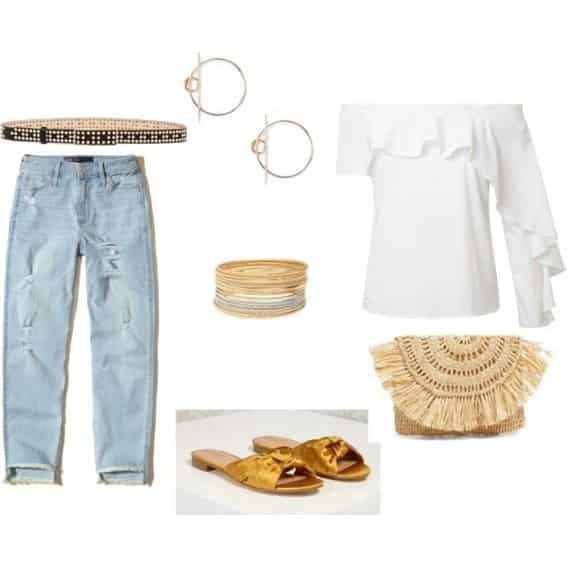 If you, like me, are a little skeptical about this look, take note from Rocky’s outfit: fitted boyfriend jeans are a perfect pairing for a one-shoulder ruffle top. This is a great outfit to wear while doing some sightseeing while on vacation. Or, you know, brunching with friends in your town this summer. Ah the denim jacket: a classic. Paired with a simple outfit and slung over the shoulders blogger-style, an oversized denim jacket is a wardrobe statement. I love how Rocky edged her ensemble up with these studded heels. I was able to find a very similar pair from NastyGal, which is constantly running sales right now. This means you can get her look for a fraction of the price. Which of these outfits was your favorite? And who would you like to see featured next on Instagram Style Steal?